walking away with prestigious awards in recognition of their contributions to the Asian movie industry. A host of presenters took to the stage last night, including Hong Kong director Johnnie To, and Chinese celebrities Sean Lau and Gao Yuanyuan, to introduce the nominees and winners of various categories. 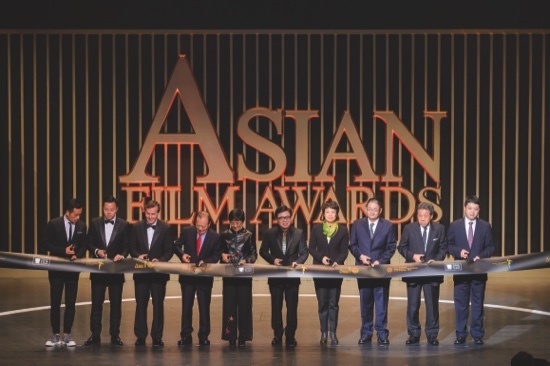 Many of them congratulated the award ceremony on reaching its tenth edition, and some added that the AFA had accomplished much to both promote the city of Macau and Asian cinema. Lifetime Achievement Awards were presented to veteran Hong Kong action choreographer-director, Yuen Wo-ping, and venerable Japanese actress Kirin Kiki, honoring years of distinguished contribution to Asian cinema. Korean actor Yoo Ah-in, who starred in “Veteran” and “The Throne”, received the Next Generation Award in recognition of his outstanding and breakthrough acting performances last year. “The Assassin”, a joint Hong Kong, Taiwan and mainland China martial arts film directed by Hou Hsiao-Hsien, was awarded “Best Film” during the ceremony. Hou, who is Taiwanese, was also presented with the award for Best Director for his work on the same film. “Best Actor” went to South Korea’s Lee Byung-hun for his leading role in “Inside Men”, a political thriller film that dissects the corruption within Korean society. Meanwhile the counterpart award, “Best Actress”, went to Shu Qi for her leading part in “The Assassin”, in which she portrays a killer ordered to slay unethical government officials. Other notable winners last night include, Asano Tadanobu (Best Supporting Actor), Zhou Yun (Best Supporting Actress), Jessie Li (Best Newcomer), and Jia Zhangke who was awarded Best Screenplay for “Mountains May Depart”. Additionally, Mark Lee, Lim Giong, and Hwarng Wern-ying were all recognized at the AFA for their contributions to “The Assassin”; winning awards for Best Cinematography, Best Original Music, and Best Production Design, respectively. 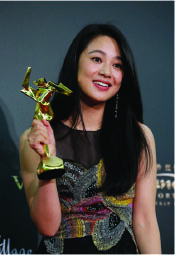 Chu Shih-Yi, Tu Duu-Chih and Wu Shu-Yao were jointly awarded Best Sound for their work on the same film. In other areas, South Korea’s Lee Ji-yeon and Shim Hyun-seob won Best Costume Design for “The Throne”, while India’s Prasad Sutar was awarded Best Visual Effects for the film, “Bajirao Mastani”. “So we set up the awards,” he continued, “to promote a space for young filmmakers and enthusiasts to share ideas and learn from each other. We are doing our best to ensure that Asian films come to the forefront” in terms of international recognition. French actress, director and screenwriter, Sophie Marceau, was also invited on stage as a guest of honor.